Progress continues to be made on the new Library and Arts Center project. The much anticipated project will consist of a two-story Library and one-story Arts Center which will share an adjoining outdoor paseo. The facility designs have been finalized and approved, with the City Council authorizing staff to solicit bids for the construction of the project at the September 18, 2018 City Council Meeting. This contract is scheduled to be awarded later this year, with groundbreaking to follow. Completion of the project is anticipated to take place in Summer 2020. Additionally, at the September 18 meeting, the City Council selected the name “Yorba Linda Cultural Arts Center” for the Arts Center after a naming process that involved community feedback and a recommendation from the Parks and Recreation Commission. The “Virginia DeLand Theater” was also selected as the name for the Art Center’s Black Box Theater, which will be posthumously named in honor of the founding Director of the Yorba Linda Civic Light Opera. At the May 1, 2018 City Council Meeting, City staff updated the public on the current phase of the project. City staff and Group 4 Architects are finalizing Construction Documents, which will be followed by a Plan Review and a Bid for Construction (projected completion in late summer 2018). Ground breaking and construction on the new facilities should occur in the fall of 2018, with projected completion of both facilities in summer 2020. Follow this link to view the presentation to the City Council. The Library and Arts Center passed another milestone at the February 6, City Council meeting when the City Council directed staff to continue to move forward with the Construction Documents phase of the project. Group 4 Architects presented the current design of the Library and Arts Center as well as comments from the final round of community outreach. Groundbreaking is expected to take place at the end of the year with the grand opening of both facilities slated for summer 2020. On your next visit to the Library, when you are checking out materials, you might see two large boards with a number of pictures and colored stickers. What is this you ask? 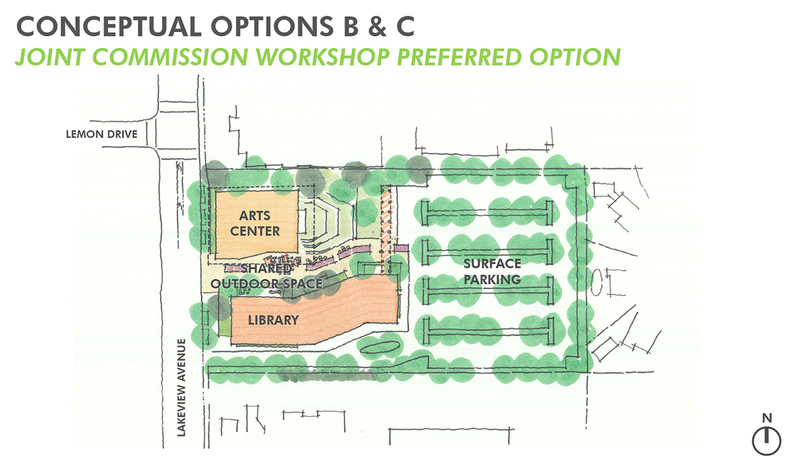 Well, it is for your input regarding the new Yorba Linda Library and Arts Center. We would like to know what your priorities include when it comes to the new facility. You’ll find a selection of areas that include group space, digital arts, outdoor gathering space, study areas and numerous other options. Stop by the Information Desk on the Main Floor or the Circulation Desk to pick up stickers so that you too can add your priorities.